Steelcase i2i Collaborative Chair (SCI2I) at Pure Design / Seating / Workspace ::: Furniture for the Home, Office, Home Office, and More at Pure Design Online! i2i is a new collaborative seating alternative that is free of adjustments, yet has a flexing back that offers both movement and support. It accommodates a variety of postures so people can remain engaged, focused and connected. Flexing fingers form the back and offer support while moving and conforming to your body. The optional mobile base (extra charge) includes two rollers on the front arms of the base that allow the chair to be moved easily. 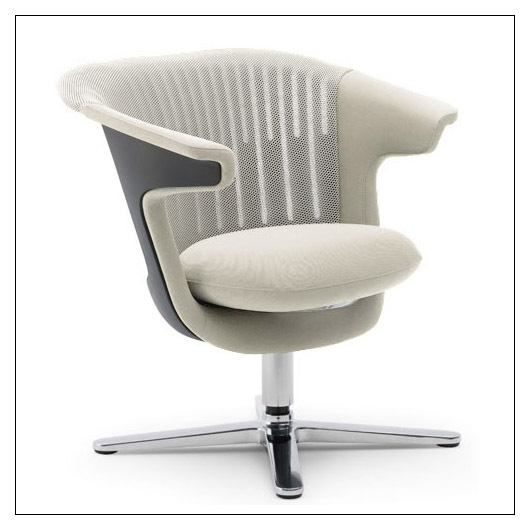 The Design Forum International honoured the i2i chair with the coveted iF Design Award. The iF Design Award has been one of the most important design awards since 1954. Also winner of a silver Industrial Design Excellence Award, which is judged independently by IDEA (Industrial Designers Society Of America). This product is MADE TO ORDER and therefore CANNOT BE RETURNED. Please allow an additional 4 weeks to ship. This item can only be shipped to street addresses in the contiguous 48 United States.